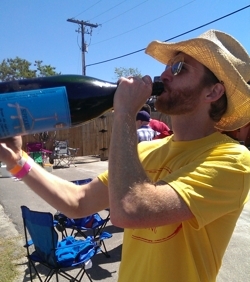 At Hunahpu’s Day, you can drink Russian River Supplication directly from a double magnum. In a crisis, be aware of the danger – but recognize the opportunity. Cigar City’s Hunahpu’s Day 2014 is a day that will long be remembered in craft beer lore. It was a day when joy turned to frustration and a craft beer magnate admitted defeat. On Saturday, March 8, Cigar City Brewing held the 5th annual Hunahpu’s Day, a release party and festival for one of the nation’s most sought-after beers, Hunahpu’s Imperial Stout. Hunahpu is #16 on Beer Advocate’s Top 250 list, and it’s limited availability has created a passionate following and intense demand. On Saturday, demand turned into debacle. The first four years of Hunahpu’s release event were first-come-first-serve events where people would line up four hours in advance of sales. Last year drew an estimated crowd of about 9,000 people. In an attempt to make the event more manageable and fair, Cigar City made it a ticketed event and allotted 3,500 tickets. In addition to selling bottles of Hunahpu, Cigar City turned the event into one of the premier beer festivals in the area, featuring over 150 rare beer and special batches from local and national breweries and six area homebrew clubs. Now THAT is a tap wall. Since this was the first time they charged admission to the event, you would expect there to be unanticipated logistical problems. However, when the unexpected results in way too many people getting in and not enough of the prized beer to go around, you might need to call out the National Guard. I had the opportunity to volunteer at the event, so I was there an hour before the festival began. I was pouring beer at the Cigar City tap trailer for a couple hours. I received my first inkling that things were not right when Nicole and I were asked to go up to the front gate around 1 pm to help get people into the festival. It was pretty chaotic when we arrived at the front. The line of people went down the street and around the corner beyond where I could see. The volunteers quickly got organized help speed the process of putting wrist bands on the people coming in. The people coming in were telling tales of being in line for over two hours. Most of them were in good spirits, knowing they were about to enter into a beer oasis. The second inkling that things were not right was when my volunteer shift ended at 2:00. In the hour that I went from pouring to the front, the festival went from a fun, free pouring good time to a drunken grid-lock. It whole vibe shifted on a dime in less than an hour. I decided to get in line for my free volunteer bottle of Hunahpu around 3:00. But the “lines” were not moving. The parking lot in front of the packaging warehouse where they were selling the bottles was just that, a parking lot of humanity. It was at that point I decided to forsake my free bottle, and it was time to go home. The lines for beer and food were too long, it was nearly impossible to get from one point to another. I retired to go home to a relaxing steak dinner in my back yard with a phenomenal bottle of wine. A perfect ending to an all-around great day, minus that I didn’t come home with any Hunahpu. It wasn’t until Sunday morning that I read about the fiasco that the day turned into. Somehow, they ran out of Hunahpu bottles to sell. You can imagine the outrage. They decided to refund every person that bought a ticket through Eventbrite, and they opened up their tap room on Sunday for free beer the entire day. In the week since the festival, many theories have come out as to what happened. I won’t dwell on speculation, but I do know that both Cigar City and many other individuals share responsibility as to what went down. In my experience as a volunteer, Cigar City was not well organized and did not coach up their people very well. In particular, this was evident at the front gate, where all the issues stemmed. While Cigar City may not be festival experts, I would have expected that their leadership had been to enough festivals, and spoken to enough other people that have put them on, that they would have learned what works and what doesn’t. If nothing else, Cigar City’s faith in the craft beer faithful paved the way for the main culpri, duplicate tickets. Somewhere between several hundred and several thousand people acquired copied ticket printouts. The volunteers scanning tickets at the gate weren’t prepared for the onslaught of hundreds of cheaters who scammed their way in. Once those flood gates opened, it was all over. And while Cigar City may not have been prepared, that does not excuse people who took advantage using duplicate tickets or hopping fences. That greed and self-centeredness ruined the day for thousands, cost a beloved local business as much as $200,000, and destroyed a wonderful beer tradition. Joey Redner, owner of Cigar City, quickly decided to end Hunahpu’s Day and put the beer into distribution. It’s my hope that Joey and Cigar City will take some time to distance themselves once this has all blown over, and will reconsider Hunahpu’s Day for next year. It was a painful learning experience, but provides an opportunity to come back with a vengeance, stronger than ever, and to show the beer world that they won’t be defeated. It’s often when companies are at their lowest that the opportunity arises to do great things. Imagine the storylines when Hunahpu’s Day is a great success next year. An already loyal fan base will go to war for Cigar City. When customers are pissed off and furious, if you make amends and then go above and beyond, you create a loyal bond for life. Those people will fight for you, because they know you care about them. If you are interested in seeing Hunahpu’s Day come back next year, I would recommend liking the Save Hunahpu’s Day Facebook page. I know I’m willing to go back next year. Let’s bring back the tradition! This entry was posted in Beer events and tagged Cigar City, Hunahpu's Day, Hunahpu's Imperial Stout. Bookmark the permalink. It also features the line, “a bearded ginger leads the gawking rabble” — which made me think of you. Alas, I was not leading any riots or chants. I was long gone by that point. Very interesting article. I agree with Miles’ premise. It’s scarcity that makes something special. I remember when we first got Fat Tire in South Carolina. It was like a watershed moment to get this legendary beer. And then within weeks, the novelty wore off and it was just another good beer we have access to any time. I feel the same way about seasonal creep. If we keep our Christmas decorations up all year, the holidays won’t be special. If I can get Sam Adams Oktoberfest in April, it’s not special any more. We should savor that feeling of anticipation brought on by denial of self.